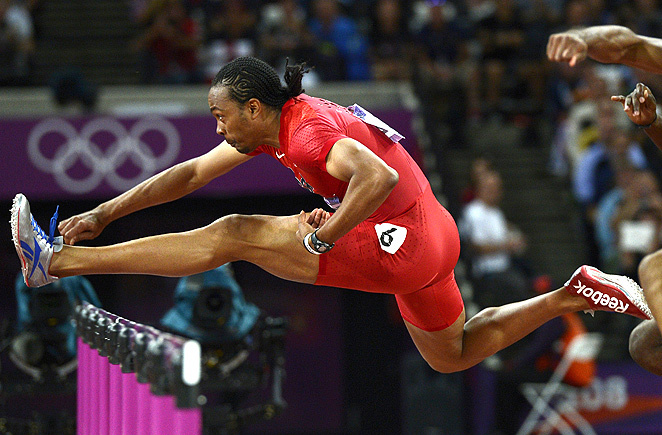 U.S. hurdler Aries Merritt won gold in the 110 meter hurdles at the London Olympics, and wants to become a household name like Usain Bolt. Aries Merritt usually has a lot of explaining to do when he tells the casual fan he's an Olympic champion and world record holder. No, the U.S. hurdler didn't beat Usain Bolt at the London Games and no, he didn't break the Jamaican sensation's record. Everyone knows the world's fastest man. The quickest hurdler? Not so much. But Merritt's looking to change that the only way he can - by going even faster and generating even more headlines. He fully believes he can break his own mark in the 110-meter hurdles, bettering the time of 12.80 seconds he ran a month after London last summer. Maybe then more fans will know his name. Like Bolt, Merritt wants to be known around the world. He said he hopes to reach "legend" status one day, same as Bolt. Merritt is certainly on the right path after a season in which he captured gold in London and later broke - no, obliterated - the world record at a meet in Brussels by shaving a full 0.07 seconds off a 4-year-old mark held by Dayron Robles of Cuba. He definitely thinks he can lower his time, maybe even into the 12.7-second neighborhood. "I'll keep the fans and people happy if I can break it again," said Merritt, whose first big meet will be the Drake Relays in April. "If I can't, but I can remain consistent around that time, that speaks for itself, too." Precisely his plan all along. "But I have a ways to go." All told in 2012, Merritt won a world indoor title, ran more times under 13 seconds than anyone ever has in a season, shined in London, captured a Diamond League crown and set a new mark for hurdlers to chase. Now he at least is sometimes recognized in restaurants, and he has a new multiyear shoe deal with Nike. Merritt said he also received a key to the city of Bryan, Texas, which is located near where he trains at Texas A&M. "I'm trying to be a realist: I don't know if I'll ever have a year like that again," said the 27-year-old Merritt, who took a big stride forward last season when he eliminated one step in his run-up to the first hurdle. "I don't think a year has been that good for anyone." Merritt was regarded as the favorite heading into the Olympics over two of the discipline's biggest names, Liu Xiang of China, the 2004 Olympic gold medalist, and Robles, the defending champion. Then, Liu got hurt in the first round of qualifying. In the final, Robles pulled up midway through, clutching his right hamstring. Merritt breezed to the title as he held off Jason Richardson to give the U.S. its first gold-silver finish in the event since 1996. But Merritt's winning time of 12.92 seconds left him a bit disappointed. Granted, it was a personal best, but with Robles hobbled and Liu not around, he felt as though he needed to run a stellar time to authenticate his medal. "In the back of my mind, I kind of felt my Olympic championship wasn't validated," Merritt said. "I didn't want people saying, `He only won because Dayron and Liu weren't able to run.' After the race, I wanted to focus on breaking that record." That record-breaking day in Brussels, Merritt flew out of the starting blocks, flawlessly glided over the hurdles and lunged across the finish line, his eyes growing big as he stared at his time. Then, he began screaming. "It felt like I won the Olympics all over again," Merritt explained. Simply the exclamation point on a season for the ages. "To race every race the way he did, you couldn't dream to run a season like he had," Nehemiah said. "It's an incredible accomplishment. "Now he needs to close that chapter and focus on blazing his own trail and legacy. I have confidence in his humility, to feed off what happened last year, but not live off of it."